Playing YouTube on your waiting room TV may seem like an easy, cost-effective solution for waiting room entertainment; but the ease of using YouTube comes with a price – one that too few business owners are aware of, and even fewer can afford. This article will highlight the top 3 risks of playing YouTube on your waiting room TV. Perhaps the most important is understanding that playing YouTube in your waiting room is illegal. Showing YouTube videos in a public setting, or pulling videos from YouTube itself for your waiting room – without expressed consent or permission, violates YouTube’s Terms of Service. In the end, you can’t put YouTube on your waiting room TV for the same reasons you can’t play Netflix. It costs a lot more than most businesses are willing to spend in order to license content legally. In addition, some content owners don’t want to play their content inside of certain businesses and it’s their decision to make, they own it. Content creators struggle to produce videos from the small amount of money YouTube ad revenue provides them. When those videos are played in a public setting, it’s effectively robbing them of monetization they need in order to keep producing. Imagine a patient comes to visit you, individually, to learn more about a medical specialty you offer. You would charge each patient that comes in for a visit. If that patient took a recording of you giving advice without your permission, and shared it with others inside of another medical practice or business without giving you your rate, you would not approve. Displaying YouTube videos is much the same way. Videos licensed for public display or distribution are priced differently than ones made for private one-off viewing. If you’ve ever spent any length of time on YouTube, then you probably know how the site will autoplay “related videos” once a video is finished. Many YouTube videos are short. In fact, that’s part of their appeal as a waiting room TV solution. But what happens when those short videos are over? A new video can be played. Automatically. Once a video is done playing, or you’ve reached the end of a selected playlist – if your screen doesn’t get stuck on a frozen menu, YouTube will automatically select the next video for you. In those cases, you’re not in control of what plays next. What comes after, however related, may be inappropriate or graphic for your visitors. Why risk it? It’s Relevant TV is a television network designed with waiting rooms in mind. It combines the best aspects of TV and digital signage; transforming your TV into a tool that will improve visitor experience, and help increase monthly revenue. Some of the world’s top TV networks as well as interesting YouTubers make their content available to IRTV through licensing agreements. This means you will have a whole host of great videos without the risks. Compared to other waiting room TV software, nothing comes close to the control and customization IRTV gives users. Pick the types of programming you want, and automatically filter out the things you don’t. You also have the added benefit of being able to mix in your own videos and messages throughout. You can learn more about It’s Relevant at itsrelevant.com. If you’re a business owner with a TV in your business, it goes without saying that at some point in time you sat down to consider what to have playing on it. Whether it’s basic cable, a DVD player or Netflix, an Amazon Firestick, or even a regular old USB drive with pictures and a slideshow, sometimes it’s time to revisit old tech and consider newer alternatives. People say “Don’t fix what isn’t broken.” And this is true – no one should fritter away money on a whim. But at the same time, there’s a risk in the comfort of long standing familiarity. People who are happy with what they have seldom consider alternatives – less out of alternatives being better and more out of avoiding the hassle of change. It’s not unusual to want to get the most mileage out something, but it’s also important to recognize when something is worth revisiting. Even if it isn’t necessarily old. DVD players, services like Netflix, and external devices such as Amazon Firestick and USB Drives have broadened the options for ways you can put things on your TV. Legality aside, throwing a movie or the latest Disney Pixar flick up on the TV still isn’t that great of a solution. Feature-length movies can be as long as 90-120 minutes – built around characters and storytelling. Unless you’re waiting for a car to be serviced, there are few instances where putting something like a movie on for the enjoyment of visitors is going to be relevant. People don’t have the same focus to devote to a movie in a waiting room, restaurant or retailer as they do at home – and there’s no guarantee that people won’t arrive in the middle of story, or walk in on spoilers of a movie they were waiting to see. It just isn’t a good fit for businesses, and it carries the risk of disappointing visitors. Movies aren’t the only thing that a DVD player is good for. Business owners who know that it’s illegal to show unlicensed videos, or don’t believe in playing videos in general, lean towards another option when it comes to what’s on their TVs – and that’s custom DVDs. It’s not uncommon for business owners to put together personal videos or collections of pictures for their TVs. While this alternative is certainly cheaper than basic cable, it isn’t without its flaws. Custom videos loop constantly. Unless the business owner has a dedicated staff member with a lot of free time on their hands to put together a large library of content, people visiting are likely going to see the same things again and again. This can get boring, and depending on the setting in which people are waiting, the comfort of your visitors can have a large impact on their satisfaction and overall opinion of your business. DVDs and USBs packed with videos and pictures plugged into your Smart TV lack a crutial level of customization. In order to update or make changes to either of those platforms, the devices need to be manually removed – and in the case of DVDs, new ones need to be made or switched out by hand. This is inconvenient, and in an age of innovative technology, shouldn’t be an option you have to settle for. Another heavy loss at the cost of using custom DVDs or slideshows is the lack of live intergrations onto your TV. Features such as the local news, weather updates, and even recent posts from social media, aren’t able to be streamed and put where people are going to see it. So what else is there? It’s Relevant TV is a custom TV service made for businesses. It gives you access to a vast library of short-form content to be played alongside your own videos to get people interested, and engaged. All of the content is licensed for public display, so you can avoid legal issues of playing commercial DVDs. Everything is divided into set categories for you to pick and choose from to keep the programming “relevant”. The platform is easy to use and fully customizable – you can easily upload videos and images from your phone or computer straight to your TV. And best of all, it’s always fresh. Without you doing a thing, IRTV constantly changes the programming to keep it all interesting for your visitors. Do away with the old, and embrace the new. 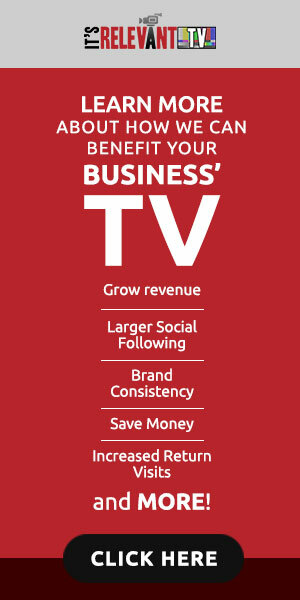 It’s Relevant TV will provide your business with so much more than a DVD player can. IRTV is constantly evolving and provides business owners with the control they desire. What do you need to consider when putting a TV service into your car dealership sales department or service department? Car dealership marketing extends beyond billboards and TV commercials. Using the dealership TV is one of the cheapest ways to get your ads seen, while bringing life to your waiting room. Customers could be waiting minutes or hours. Regardless of how long they are waiting, you want to provide them with something entertaining or informative to watch. Just having videos about serving their vehicle or commercials about your dealership aren’t going to cut it. The time your customers are waiting for their vehicles to be serviced is the absolute worst moment for them to see an attractive message from a competing dealership. Block out the competition with Competitive Ad Block®. The service automatically blocks any outside car commercials from appearing on the TV. Instead, you get more quality programming and your own promotions for your customers to engage with. The time your customers spend waiting is an opportunity for you to tell them you care about them. Educate them about your inventory, policies and what sets your dealership apart. They are going to be watching the TVs for at least a portion of the time they wait so it’s a great opportunity to put your own messaging in front of them. If customers leave without buying you need a gentle way to bring them back. Social media is a great way to connect with repeat customers and prospects alike. Get them interested in your dealership. Showcase your most recent posts on the TV and gently entice them to follow your accounts on Facebook, Instagram and Twitter. Showcasing multiple accounts is great because it allows them to follow on the platform they use the most. You’ve spent time and money making videos, why not get more mileage out of them? So many dealerships produce videos that just end up on YouTube or for a limited time on local cable. You can use these same videos inside your dealership to increase customer awareness of your promotions, inventory, and specials. What are you using in your dealership today? If it’s Cable or satellite, you are missing a great opportunity to both spread your own messaging and to block out messages from your competition. If it’s a custom solution you may not be showing enough interesting content, and/or might be paying too much for it. See what It’s Relevant TV for Car Dealerships has to offer. For less than most dealerships pay for a basic cable service, It’s Relevant is able to achieve all 5 goals above, with a unique non-looping platform. You can speak to a TV consultant about dealer TV options by calling toll free: 855-ITS-RELE or by emailing: sales@itsrelevant.com.